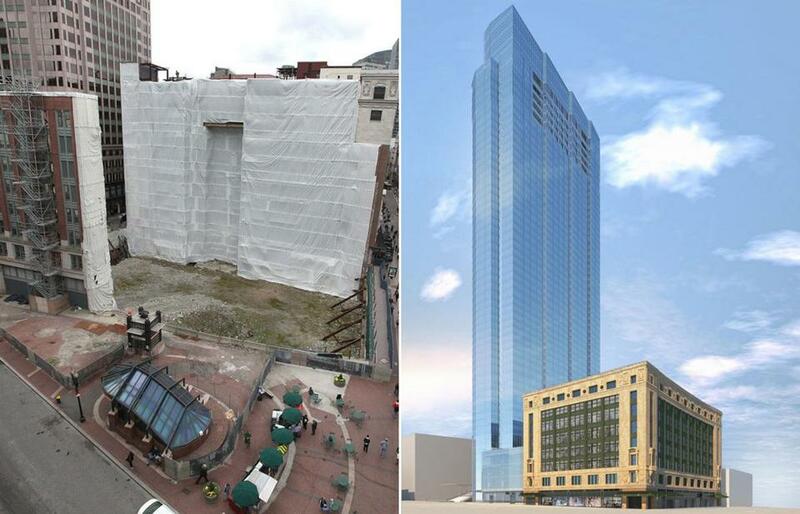 Developers plan to build a tower (right) at the Filene’s site in Downtown Crossing. 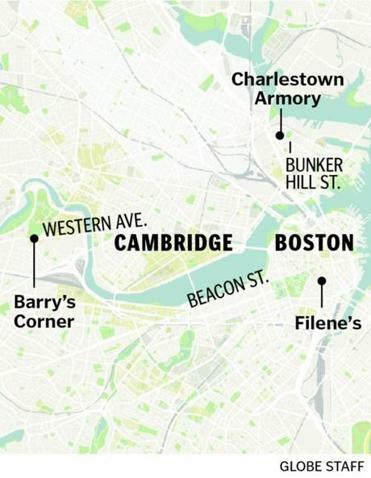 The long-stalled Filene’s redevelopment in downtown Boston will resume within days, as the project’s developer has signed the advertising firm Arnold Worldwide to occupy a large chunk of a $630 million complex of offices, stores, and luxury homes. The upcoming work will bring life back to the property and accelerate the broader revitalization of Downtown Crossing, where the blight at Filene’s has undermined an otherwise robust period of construction activity. Construction on the property will unfold over the next several years. Developer Millennium Partners will renovate the original Filene’s store into a retail and office complex for Arnold and other tenants. Next door, it will build one the city’s tallest structures — a 60-story glass tower with 450 condominiums and additional stores. The project is one of several major developments moving forward in the improved economy. Earlier this week, construction started on the Ink Block, which will replace the former Boston Herald headquarters in the South End with a Whole Foods market and 475 residences. And on Thursday, Boston regulators approved construction of another 325 apartments and stores at Barry’s Corner in Allston. Other projects are also proceeding in Dudley Square, Charlestown, and the South Boston Innovation District. Of all the developments, Filene’s promises to have the most significant impact on the city. Located in the heart of Downtown Crossing, at Washington and Summer streets, the project is expected to lure hundreds of residents as well as new shopping and dining options to an area that has just begun to shrug off a reputation as a ­second-rate retail destination. Arnold and its sister agency, Havas Media, will occupy about 125,000 square feet in the restored Filene’s building, bringing about 700 employees to the site. Barry’s Corner in Allston gained approval from Hub regulators this week. The Filene’s store was the last major building by the renowned architect Daniel Burnham , who died months before its opening in 1912. Part of an early generation of steel-framed high-rises in the nation, the building is now gutted and missing an outer wall. But Millennium Partners plans to restore many original architectural details, including its metal and glass canopies and its distinctive wall of glass along Washington and Summer streets, where new retail shops and restaurants will eventually open. The renovated Burnham building will contain more than 135,000 square feet of retail on the lower floors and basement, and nearly 200,000 square feet of office space on the upper floors. Arnold, which was represented by the real estate firm Cassidy Turley of Boston, will take occupancy of the top four floors of the building in September 2014. Millennium Partners was represented by CBRE, New England. The developer is talking with a wide range of stores and restaurants interested in the site, but no new retail tenants have been named. The project also includes the renovation of a neighboring park that will get a new ­MBTA station entrance and outdoor amphitheater. The Filene’s project will join several others already underway in the downtown area, including a 256-unit condo building at Millennium Place, a 381-unit apartment tower by Kensington Investment Co. on Washington Street, and a third residential tower at the edge of the Rose Fitzgerald Kennedy Greenway in Chinatown. 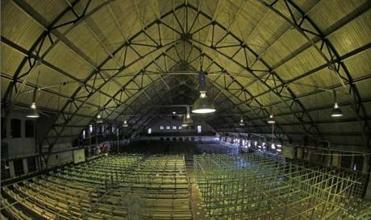 The city seeks proposals for the Charlestown Armory on Bunker Hill Street. An inside view shows shelves for the library annex. Construction on the property stalled in 2008, as a deepening recession dried up funding for the massive project. The developers — a team led by New York-based Vornado Realty Trust — spent years trying to resurrect the development, to no avail. The city eventually pulled the project’s permit amid a bitter war of words with Vornado executives. Last year, Millennium Partners took over the effort, revamped the development plans, and won approval for 1.2 million square feet of commercial and residential space in two buildings. The main element of the project is a slender glass skyscraper that will contain 450 luxury condominiums and will likely become a new focal point on the city’s skyline. That building, which will be linked to the Burnham building on its lower floors, will also include 95,000 square feet of retail space.